UX designer and meetup organizer who likes tech and horses. A talkative Swedish vagabond currently based in Stockholm. IT Woman of the Year 2015. For me being a user experience designer means I care about making products that work really, really well. I think technology should work for people, not the other way around. I love being a part of almost every aspect of product development; from identifying user needs and opportunities, ideation, facilitation workshops, sketching, wireframing, prototyping, usability testing, UI design, pair programming front end to final user feedback. Then going back and doing it all over in the pursuit of happy users and the dream of building a something really great. I believe the best products are made in close nit agile teams. Mic is an american news site with the ambition to become the voice of the millennial generation. Reaches 30 million on a monthly basis. Expressen is Swedens fastest growing news media site. A part of Bonnier News Group. Aftonbladet is Swedens largest news media site with a weekly readership of 10 million. A part of Schibsted Media Group. Netlight is a genuine consulting firm based on a culture of social professionalism. Thomas Cook Group is one of Europes largest travel providers with a multitude of brands including Ving, Spies and Tjäreborg. Imagine you have nothing to sell – What conversion to you optimize for? With insights from Mic and Swedish GIANTS Expressen & Aftonbladet you’ll learn News Media Online Optimization. 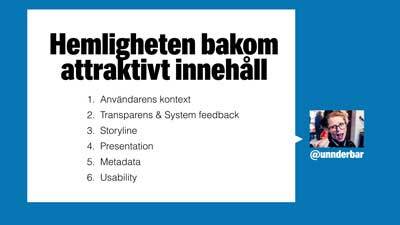 In my work at Aftonbladet and Expressen I have created a framework for designing a personalised news experience. Intressantast hittills på #webbdagarna - @unnderbar om personalisering. Överväger du öht att bygga personaliserat, se webbsändningen!